Merry Meet Magickal Travelers Welcome to Eclectic Enchantments. The perfect gift for a Prop Collector, Halloween Enthusiast, Bette Midler fan, movie prop entrepreneur or witch. A lovely display for the kitchen witch, where to keep the most delicious recipes! 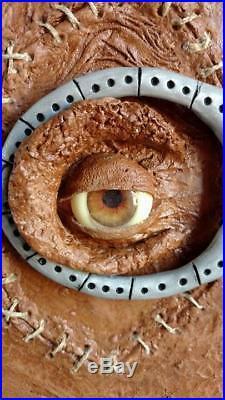 A spooktacular Halloween prop. Use with your most haunting magics or displayed at your most wicked parties! A great sight for all the lil trick or treaters that will speak of your enchanted and curious display in your entryway for years to come! Use a page for your party guests signature…. Add photos and embellishments, the possibilities are endless. 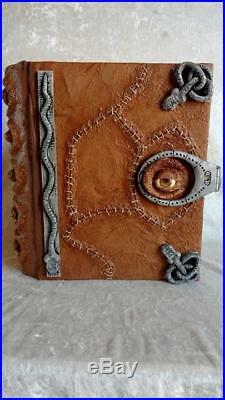 Inspired by the 1995 movie Hocus Pocus is my spellbook belonging to Winifred Sanderson. This Book has a GLOWINTHEDARK EYEBALL! Over 300 coffee stained, acidfree pages WOW!! containing 44 spell filled pages, consisting of Winifred’s most evil spells, and added, musthave pages for every witch; included are. Spells to Resurrect the Dead. Calling the Dark Diety. Lingering Immortal Spell Extented. The Legend of Amoinen. Lure Innocent Children Spell. Hell on Earth Spell. PLUS: Double Double Toil and Trouble. Blank pages for your additions. Book measures roughly 11.5″ (11 1/2″) tall x 11.75″ (11 3/4″) wide. Thickness 4.5″ (41/2″) (snake to snake). The front cover page is blank so that you may transform the pages into your own Book of Shadows introduction or simply keep it blank. 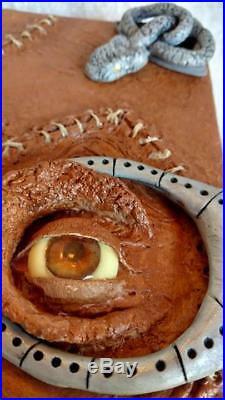 Bound in’human skin’, with over 100 stitches. Behold the eye which guards this wicked grimoire; protected with 6 deadly snakes bewitched by the Devil himself and given to Winifred. 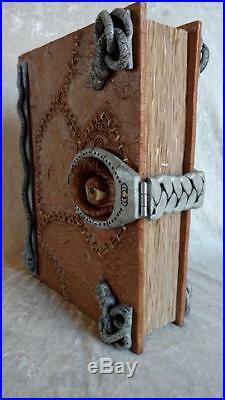 The eye’s clasp is bound to the book by a mummified hand secured to the back; Dead man’s fingers grip the spine. The book is created with a functioning clasp, made with a metal skeleton that secures the book closed. 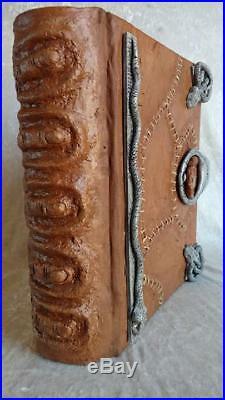 This book has been created with, but not limited to, paper mache, paper mache clay, high grade polymer clays, metal hardware, swarovski crystals, paper, rich coffee, acrylic paints, other materials and lots of love and patience. Thank you for stopping by for spell! Please fly by my other auctions and see what’s brewin’! IMPORTANT: PLEASE READ BEFORE PURCHASING. Please read the description fully and carefully before purchasing. Each item is described in as much detail as possible. Each enchantment crafted is unique and one of a kind. Created with lots of love and care, passion, imagination and a lil magick! The pictures do not show how beautiful the colors really are. It’s an honor to create and share these truly magickal treasures. Nothing here is factory made, mass produced or made in China! Please be sure to READ THE DESCRIPTIONS CAREFULLY before purchasing. Stay for a spell View my other Enchantments and see whats brewin’! If you have any questions please contact Eclectic Enchantments. Get images that make Supersized seem small. Tailor your auctions with Auctiva’s. Track Page Views With. Auctiva’s FREE Counter. 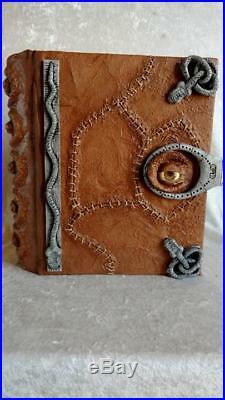 The item “HOCUS POCUS GLOWING EYE Witch Spell Book Inspired Replica Movie Prop Handmade” is in sale since Friday, February 9, 2018. This item is in the category “Collectibles\Holiday & Seasonal\Halloween\Current (1991-Now)\Decorations\Other Current Halloween Décor”. The seller is “lil_witch_be_me” and is located in Shelbyville, Tennessee. This item can be shipped to United States.